American firm The Ranch Mine has overhauled and expanded a Phoenix residence, adding limestone cladding and generous terraces, and reorganising the home so it capitalises on views of the desert terrain. 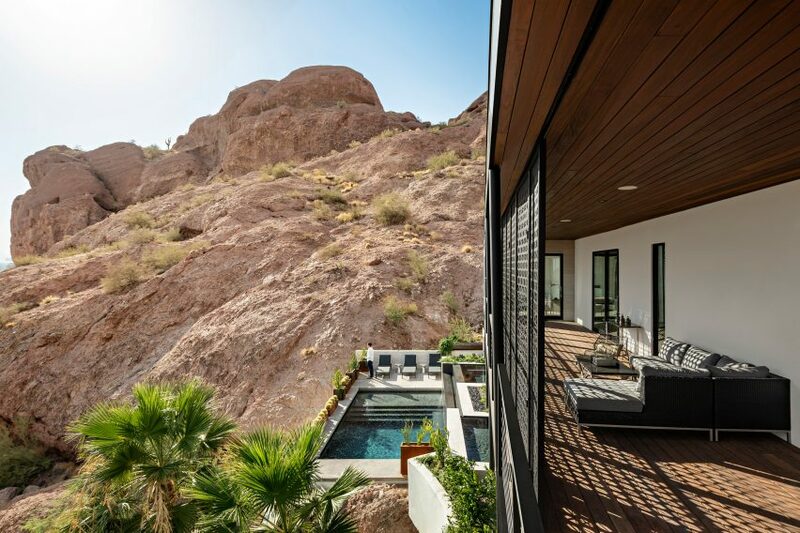 The Red Rocks house hugs the side of Camelback Mountain and overlooks the vast desert metropolis below. Local studio The Ranch Mine was tasked with transforming a Spanish colonial revival-style house into a modern dwelling with generous views and plenty of opportunities to enjoy the outdoors. “When the homeowners approached Claire and Cavin Costello of The Ranch Mine to redesign their mountainside home, they were frustrated by the thick columns that interrupted the views, the heavy clay tile roofs and dark beams, and the floor plan that focused more on a ceremonial entry than the indoor/outdoor lifestyle they craved,” said the architecture firm in a project description. The first corrective measure involved stripping away the Spanish elements, which resulted in a simple, two-storey box sheathed in stucco. The team then added a second-storey volume that cantilevers over the site, reducing the impact on the landscape. The addition is wrapped in vein-cut Veracruz limestone. 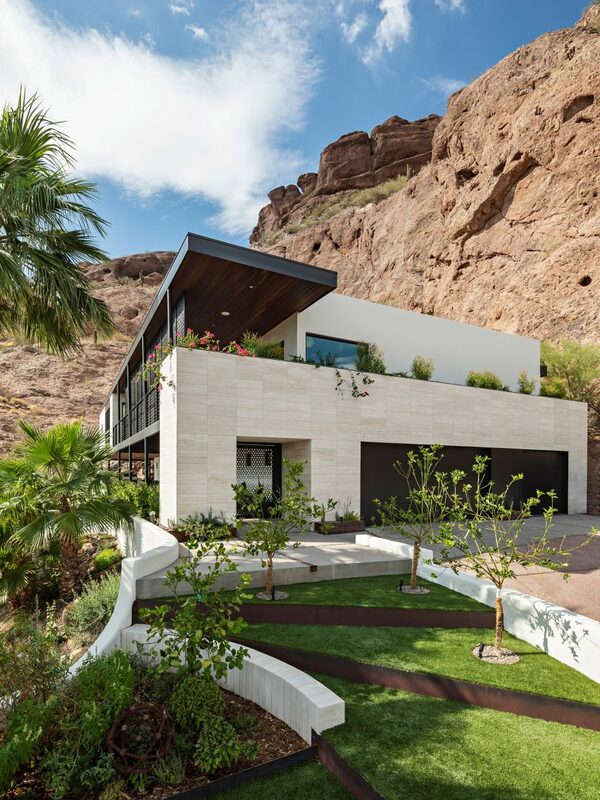 “Rather than mimic the red sedimentary sandstone of Camelback Mountain, limestone was chosen to make the addition appear like the calcite veins that often appear in the red rocks, marking their moment in time,” the team said. 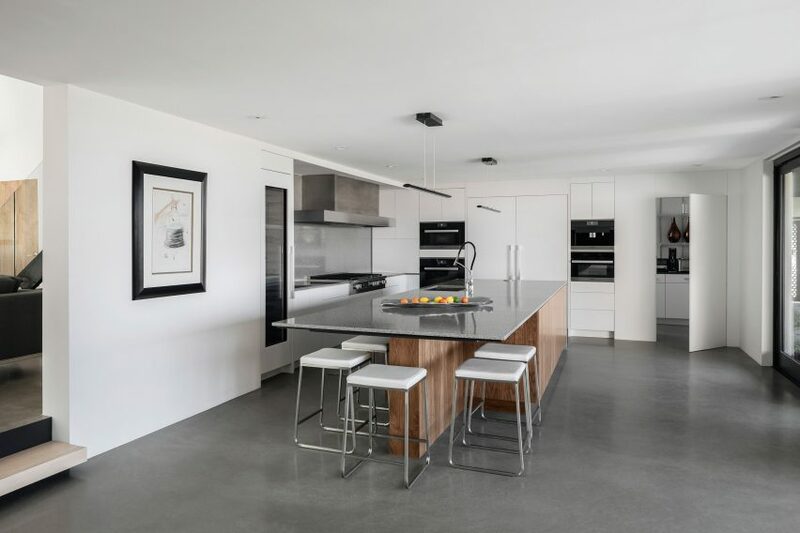 Inside the 4,490-square-foot (417-square-metre) home, the architects rearranged the floor plan in order to prioritise the connection between living spaces and primary vistas. 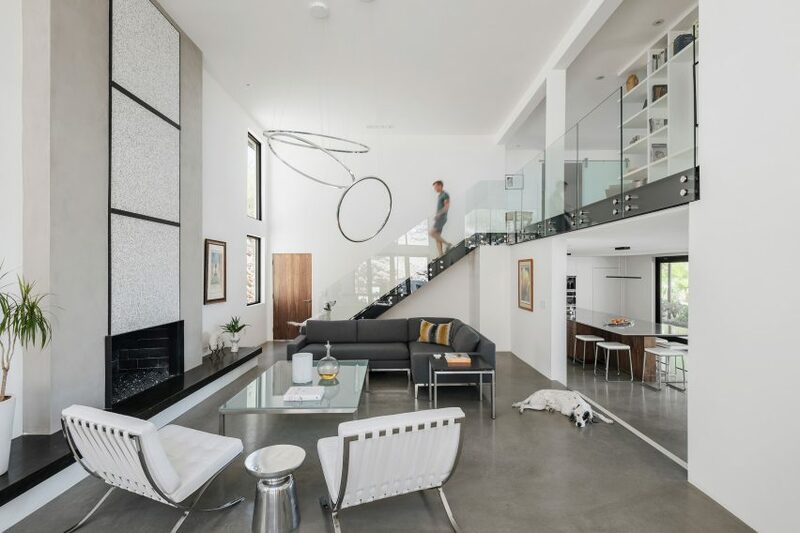 A staircase was even relocated to allow for a view from the front portion of the home through a glazed wall in the rear. 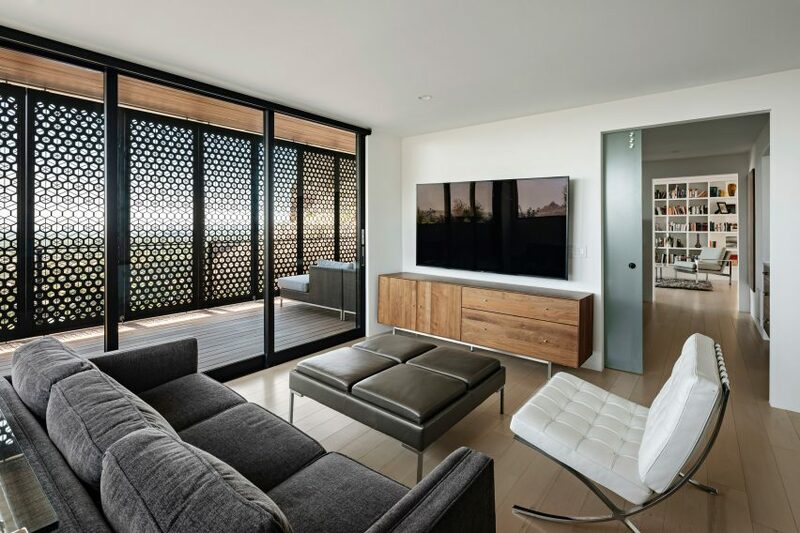 Public spaces occupy the ground level, while the second storey houses several bedrooms. 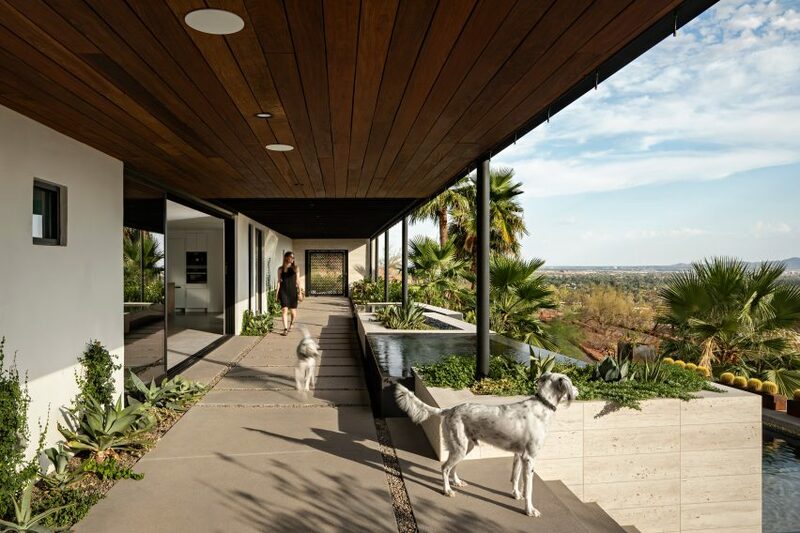 Ample glazing throughout the dwelling provides views of the city and the desert landscape. To provide numerous opportunities for indoor-outdoor living, the team created shaded, exterior terraces that total over 2,000 square feet (186 square metres). On the first level, a covered patio looks upon a stepped backyard with a fire pit, hot tub and swimming pool, along with an array of native plants. 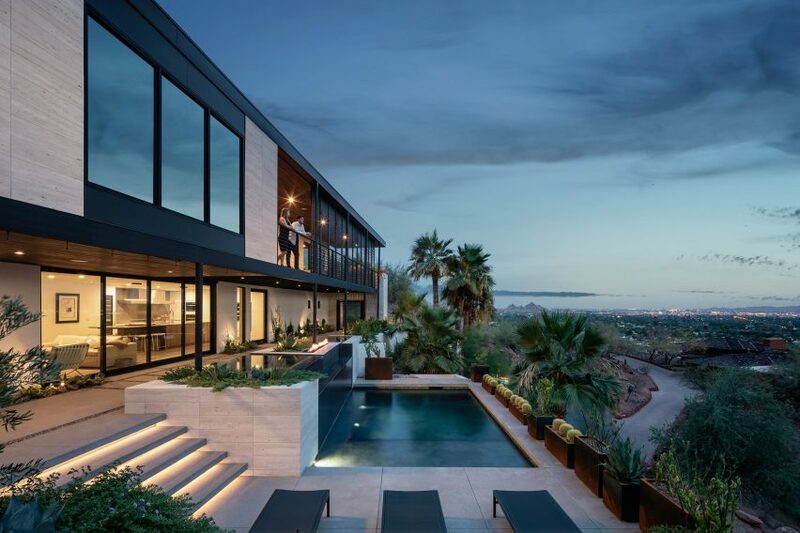 On the second floor, a south-facing patio has bi-folding, custom steel screens that help block the intense desert sun while still allowing breezes to pass through. In the central portion of the screen, the hexagonal patterning is less dense, which allows for clearer viewing. At dusk, the owners can fold up the screens entirely to enjoy the dramatic Arizona sunsets. The second level also features a small balcony, which is adjoined to the new addition. “A modern take on a Juliet balcony cantilevers out, almost kissing the mountain, creating a powerful connection and an intimate moment,” the team said. A restrained palette of materials and colours was used for finishes and decor, in order to keep the focus on the scenic terrain. Rooms are fitted with sleek decor in hues of white, black, and grey, with wooden pieces adding a touch of warmth. On the ground level, a low-maintenance concrete floor was poured. This lends to the home’s modern atmosphere, and also covers extensive work that occurred to mitigate structural and plumbing problems. On the upper level, the team retained wooden flooring. 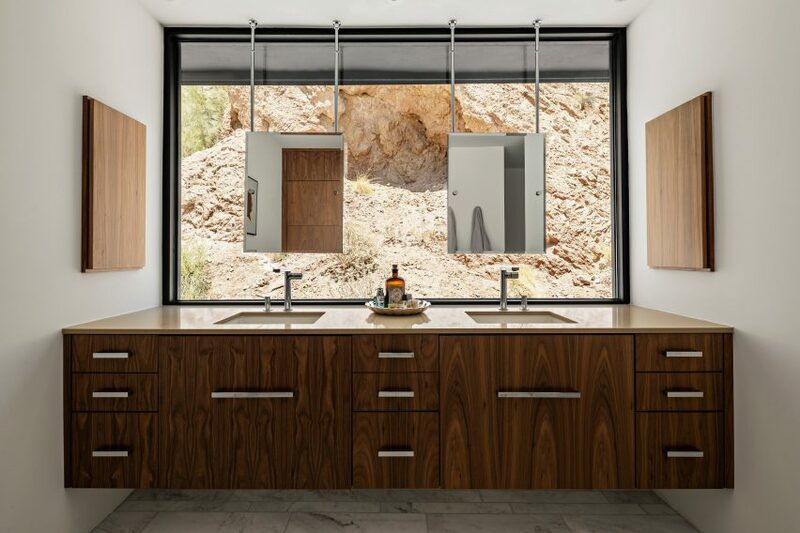 “A fairly neutral palette of walnut and white cabinetry, with a variety of quartz counters and marble tile, were used throughout to keep the red rocks as the star material,” The Ranch Mine said. Based in Phoenix, The Ranch Mine was founded in 2010 by the Costellos. Other projects by the studio include a canal-side residence that takes cues from mission-style architecture, and a series of townhomes wrapped in brick, stucco and weathering steel.